Witnessing a loved one’s life falling apart due to drug or alcohol addiction is nothing short of heartbreaking. Trying to reason with the addicted person—pleading, begging, reasoning, sobbing, or yelling—may have fallen on deaf ears. Hopefully at some point the loved one sees the light and agrees that he or she needs professional treatment for their substance use disorder. Others, however, may be stuck in denial, still believing they are in control. Others may know their addiction is out of control but may be terrified of detox and rehab. Meanwhile, both the addict and their family continue to suffer. When a loved one is not receptive to the idea of getting treatment, and the negative consequences of the addiction continue to mount, it may be appropriate to consider conducting an intervention. While some may attempt to confront their loved one with a DIY intervention, the outcome will most likely not be what they were hoping for and could even make matters worse. A professional interventionist is well trained in managing the specific issues and intense emotions that are common during an intervention. For the best chances of a positive outcome that hopefully ends in the loved one agreeing to go into rehab, it is always advisable to hire professional interventionist services like those offered by Ken Seeley Communities. 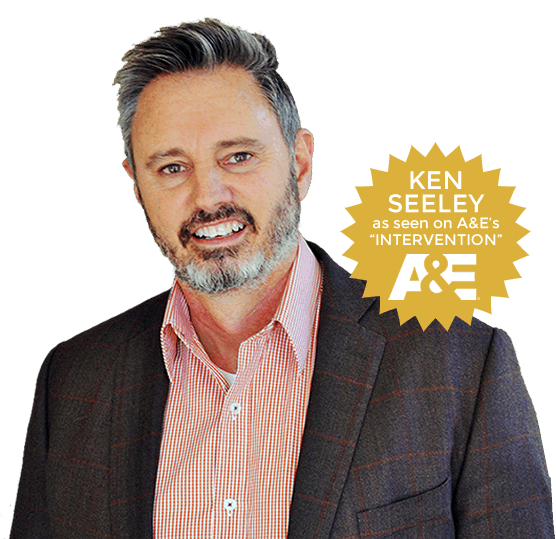 Ken Seeley is a highly acclaimed certified interventionist, and a regular interventionist on A&E’s hit series, Intervention, as well as a contributor on the major networks and cable news programs. Ken Launched his intervention services following years of experience working in the field of addiction treatment and recovery. His intervention style, and that of his associate interventionists, is one based on compassion and respect, while utilizing expert motivational skills to persuade the individual to get the help they need. Prior to the intervention date, family and friends are invited to write letters to their loved one describing how the drug or alcohol addiction is affecting both the addict and themselves. The interventionist will walk the group through the possible scenarios that may occur during the intervention, and offer suggestions for successfully navigating them. They will rehearse the intervention to prepare for possible responses their loved one might have, allowing the group to feel somewhat confident in what to expect during the real thing. Loved ones will decide the ways that they will agree to support their loved one in recovery, as well as the consequences they must abide by if their loved one rejects treatment. Boundaries are also discussed, how to set reasonable boundaries and plans to adhere to them. Finally, a decision is made as to who all will participate in the intervention session. After a date is set for the intervention, the group will wait until the last minute before asking their loved one to meet up with them. When a professional interventionist is at the helm, they will orchestrate how the meeting will unfold per the rehearsed pre-planning session. The members of the group will have an opportunity to share their feelings, fears, and frustrations with the addict with the interventionist guiding the session. Emotions can be highly charged during these meetings, which is an important reason for hiring a professional to lead the intervention. These professionals are trained to maintain the forward momentum and keep the conversation on track, as well as to help the group communicate effectively and productively. When anger flares or tears flow, the interventionist is right there to help the group move forward. Once the group has shared their concerns and feelings the interventionist will present a treatment plan to the addict, and ask him or her if they are ready to accept their loved one’s support and get help. The addict is expected to give an answer then and there. If the addict declines the offer to get treatment then the members of the group must follow through with the consequences they had outlined during the planning meeting. If he or she agrees to get help, then the group will support them in preparing for rehab, during rehab, and in recovery. An effective interventionist can be profoundly inspiring, motivating the addict to want to restore their health and well-being and reclaim their life. Contact Ken Seeley Communities and Rehab today at (877) 774-0502.